In June, the American Association for Cancer Research (AACR) launched a new funding initiative – the AACR NextGen Grants for Transformative Cancer Research. These grants, intended to stimulate highly innovative research from young investigators, are the vision of AACR Past-president Carlos L. Arteaga, MD. Throughout his presidency, Arteaga championed the development of a grant mechanism that would springboard talented young scientists into successful careers in cancer research, while also generating fresh ideas and new approaches that would lead to novel breakthroughs in the field. His motivation to lead this initiative stems from the funding crisis that continues to loom over scientific research, which tends to particularly impact early-career researchers. 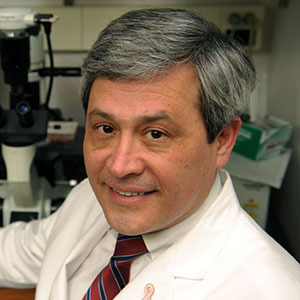 Carlos L. Arteaga, MD, immediate past-president of the AACR, championed the development of the AACR NextGen Grants for early-career investigators. The deadline to submit a Competitive Letter of Intent for the NextGen Grants for Transformative Cancer Research is Monday, Aug. 10, 2015. For more information, please visit www.aacr.org/nextgen.